And I knew in my bones that Emily Dickinson wouldn’t have written even one poem if she’d had two howling babies, a husband bent on jamming another one into her, a house to run, a garden to tend, three cows to milk, twenty chickens to feed, and four hired hands to cook for. I knew then why they didn’t marry. Emily and Jane and Louisa. I knew and it scared me. I also knew what being lonely was and I didn’t want to be lonely my whole life. I didn’t want to give up on my words. I didn’t want to choose one over the other. Mark Twain didn’t have to. Charles Dickens didn’t. 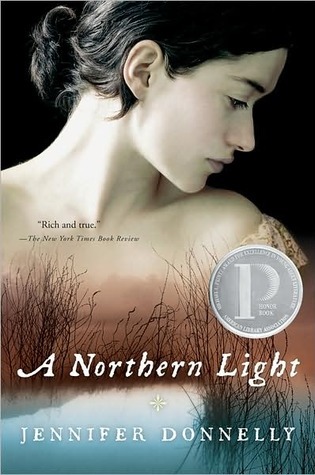 Mattie is the oldest daughter in a very poor family in upstate New York in early 1900s. She loves to read, which made me like her immediately. She and her best friend Weaver, play word games with each other every day to keep up their vocabulary. Mattie dreams of going to college and becoming a writer, but she promised her mother before she died that she would help take care of the family. She has become a second mother to her younger siblings and her father depends on her to help take care of the house and the few livestock they have. Mattie takes a job at a local hotel to make some extra money. While there one guest gives her a stack of letters and asks Mattie to burn them. This woman was fighting with the man she came to the hotel with and later on is found dead. This murder mystery is what interested me to read this book in the first place, but that is such a minor part of the entire story. At first, I was annoyed that there was so much time spent on Mattie’s family and friends, as well as the general way of life in the town when I wanted to know what happened to the poor woman that died. Then, I was sucked into everything that I was reading. The characters were great. I really felt for the poor widow that lived next door to Mattie’s family that had people take advantage of her due to her situation. I really did not like Royal, the pretty boy that all of Mattie’s friends said she should marry and forget college. I loved Miss Wilcox, the school teacher who was in a similar situation as Mattie where she had all these people telling her what she could and couldn’t do as a woman instead of letting them make their own choices. By the time the story wrapped around to the murder mystery again, I had almost forgotten it had happened and was fine that this book ended up being different than I had expected.